Before we headed out to Michigan this morning for the Thanksgiving holiday, I thought I would use up some leftovers for breakfast. I had a few baked sweet potatoes in the fridge and I’d been dreaming of using them for these yummy muffins, which was a recipe I had forgotten all about until I saw the leftover sweet potatoes hanging around. The original recipe I found online called for graham crackers. I rarely have those around, but every time I make my favorite dessert – Banana Pudding – I buy 2 packages of vanilla wafers and have right around 1 cup leftover. 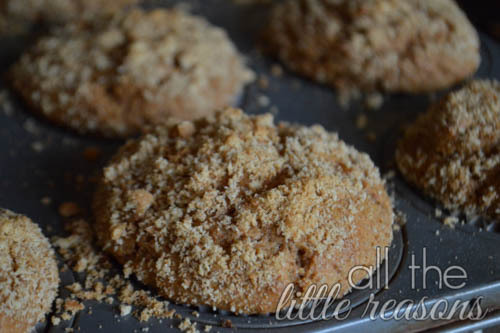 This recipe is the perfect way to use them up by substituting them for the graham crackers.